Hi again, after some really busy days, the sedimentologists now have a little time to calm down. Although new cores are coming on deck every half an hour on our new drill site on Bowers Ridge, we still have to wait a bit until the cores are ready to be split. Then we will proceed with what we have been doing for the last week or so. First, the cores are split into an archive and a working half. The working half is usually reserved for low resolution onboard sampling, while the archive is left untouched. It is also the archive we work on. First of all, the split surfaces are scraped with glass slides to reveal e.g. sedimentary structures or ash layers. Then, one of us describes the sediment according to a predefined scheme, including the colour, traces of organisms digging their way through the sediment thousands of years ago, isolated rock pieces that fell to the sea floor from melting icebergs, ash layers from one of the many nearby volcanoes… so basically everything you can see with the bare eye. Another person takes a tiny bit of the mud with a toothpick, rubs it on a glass slide with some water, and prepares a so-called smear slide. By studying these under the microscope, we gain information about the components that make up the sediment. Mostly we found remains of algae with a silica test (so-called diatoms), various amounts of mineral grains and volcanic glass particles. This provides us with a name for the sediment. All this information has to be transferred into a custom made software we really had to get used to. 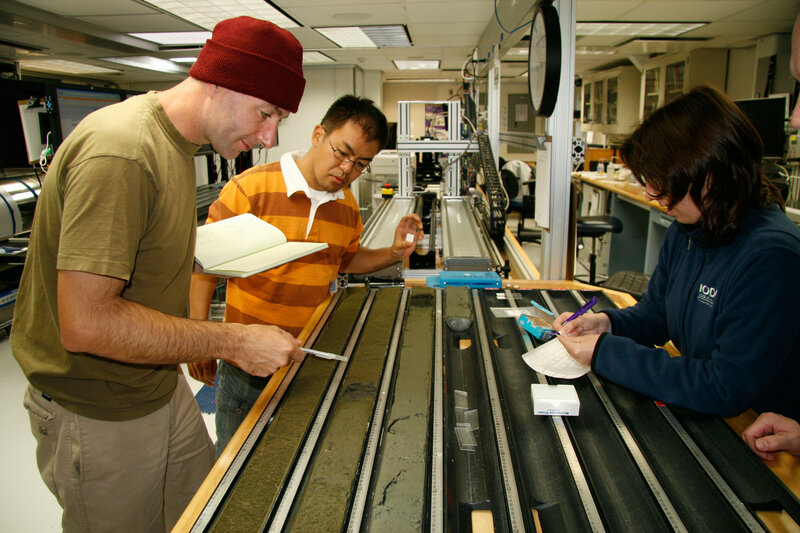 Another person sends the core halves through multi-sensor scanner systems, taking high resolution pictures of the sediment and recording colour reflectance and magnetic susceptibility. This whole procedure is exciting as we are the first ones to actually see what is inside the cores we retrieve from the deep. On the other hand, we have to be damned fast to keep the core flow, so the cores do not pile up too much before we get them. After some time, it feels somewhat like working at an assembly line on a 12 hour shift. Luckily, during short breaks we can enjoy the really great food down in the gally. I personally recommend the special Philippine soup – every day its composition varies a bit, and accoring to the ever-smiling kitchen guy it also gets more healthy every day. So by the end of the cruise, I will be healthier than every before! So far for now – the next days will be quite tough for everyone, as we drill fast and deep where no man has ever drilled before!